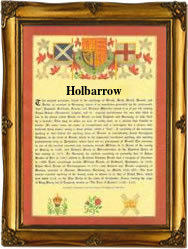 Recorded in many forms including Holborrow, Holberrow, Hulborrow, Holbarrow, Holborough, Holberry, Holbrow, Holbury, and others, this is an English surname. The varied spellings probably all originate from either the ancient village of Holborough in Kent or the villages of Holbury in Hampshire or Holbury in Cheshire. The former village has the probable meaning of 'The fort in the valley', or similar, and was one of the many that was "cleared" in the 15th century for sheep farming, and the inhabitants scattered to the four winds. As usually happened in these circumstances, the villagers took or were given as easy identification, the name of their home. As however their own conception of the spelling would have been based on local dialects since nobody would have been able to read or write, a number of versions of the supposed spelling made their appearance. Thje second village name means much the same, although is perhaps a reference to a fort which has fallen into disuse. Early examples of recordings include John de Holebury of Bedford in the Hundred Rolls of 1273, Hugh Holdebury in the same county in 1513, and Mary Holbra, who married Edward Hall at St. Dunstan's in the East, Stepney, on May 28th 1616. Elizabethe Holleberowe was christened on October 1st 1646, at St. Botolph's, London, and Charles Holbrow married Sarah Barton at the church of St. Bartholomew the Less, on May 17th 1717. Throughout the centuries, surnames in every country have continued to "develop" often leading to astonishing variants of the original spelling.